Word families are a helpful tool in teaching your child to read as once they learn the ending of the word, it is much easier for them to make new words by simply replacing the first letter. While there are several different word families, this build a caterpillar file folder game is a great way to practice a few simple ones that are perfect for beginners. 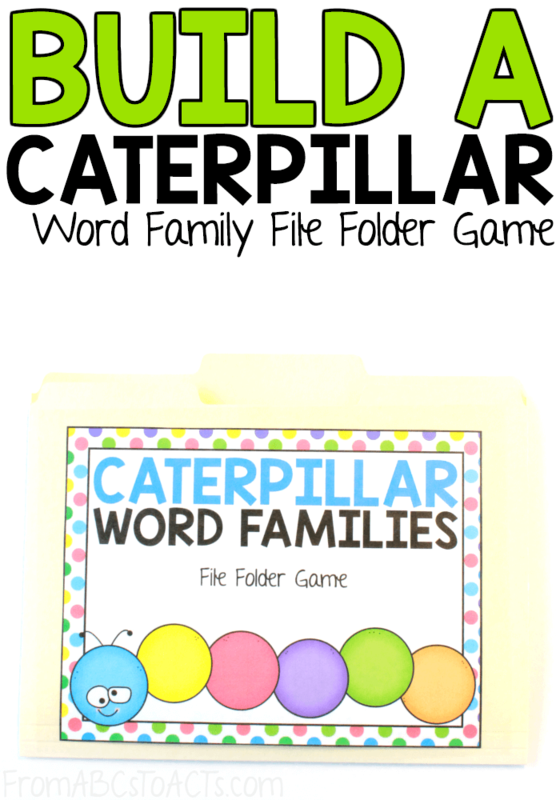 Whether you’re just getting started with word families or have been learning them for a while and are looking for a little bit of extra practice work, this caterpillar file folder game is a great place to start! These simple word families will allow your child to make and practice 18 different words. As always, to make your own, start by attaching the included cover to the front of your folder using some clear contact paper. Next, cut out each of the pieces, including both the caterpillar heads and their bodies. The heads, along with the first body piece containing the word family ending, are attached and should be cut out together. Attach the head piece to the inside of your folder using some more contact paper. With the rest of the body pieces, simply cut them out and laminate them for durability. Add some Velcro dots to the inside of your folder next to each of your caterpillar heads and add the opposite side of the Velcro to the back of each of your caterpillar body pieces. Each body piece contains a picture that belongs to one of the word families. When all of your pieces are ready, have your child determine the word on each of the caterpillar’s circles and add it to the correct word family to build their caterpillars.